Dental implants have become our favoured way to replace missing teeth lost due to periodontal disease, decay, or by an accident or injury. Dental implants act as substitutes for the roots of your missing teeth. Similar to artificial joints, dental implants are made of specially treated titanium that is totally biocompatible. Human bone is actually attracted to the titanium and will grow towards and attach to the surface of these fixtures. These fixtures can be placed into the jawbone in the location of a missing tooth and will serve as a foundation or support for a replacement tooth crown that looks and feels and functions just like your natural teeth. Implants can also be used to secure, stabilize, or support dentures and bridges. At Lane ends Dental Practice, we have found that dental implants are truly able to enhance the quality of life for our patients in Lancashire. As we only use durable and well-engineered titanium posts, intended to last for many years. Our high-quality, durable ceramic crowns are perfectly shaped to fit your jaw and bite, and colour-matched to your smile. Dental implants can improve our patients' overall health, while helping them gain the confidence that comes from a well-functioning smile that looks good and feels natural. There are many benefits to replacing missing teeth with dental implants. Missing teeth can have an affect on your occlusion, which is the way your teeth come together; another way of referring to your bite. So if you lose teeth and do nothing about it, you will still have the same amount of muscles. That means you will continue to chew with the same amount of force, regardless of how many teeth you have. As a result, the exerted force will affect your other teeth in a negative fashion. Applying more force leads to more cracks and more breakage of the remaining teeth. Loss of one or two teeth in a segment of your mouth can lead to drifting of neighbouring teeth, whereby the adjacent teeth lean over into the vacant space where the teeth have been lost. Similarly, loss of a tooth or teeth can lead to shifting of opposing teeth as they drift down into the open space. In general, our teeth have a constant tendency to move both towards the front of our mouths and towards the opposing jaw, unless they are stopped by something in their way, usually the adjacent or opposing teeth. "IMPLANT DENTISTRY DEMANDS A TEAM APPROACH"
If all your lower or upper teeth are missing, a permanent full bridge may be attached directly to multiple dental implants (subject to the quality /quantity of the existing bone). 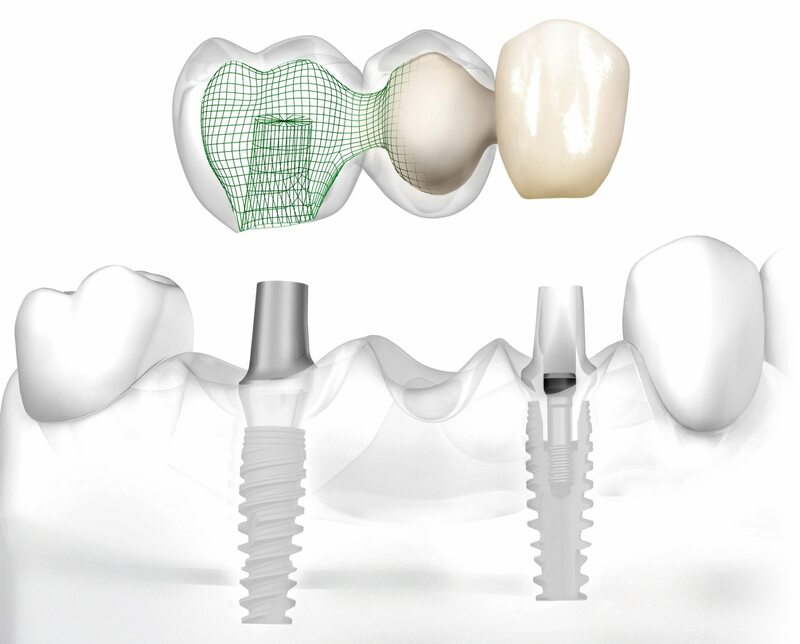 The number of implants is determined by the specific requirements of each case. Dental implants are positioned just below the gum tissue and given time to fuse with the bone. Temporary attachments (abutments) may be placed on the implants until the healing phase is complete. Your existing denture may be modified so that it can be worn without disturbing the implants during the healing process. 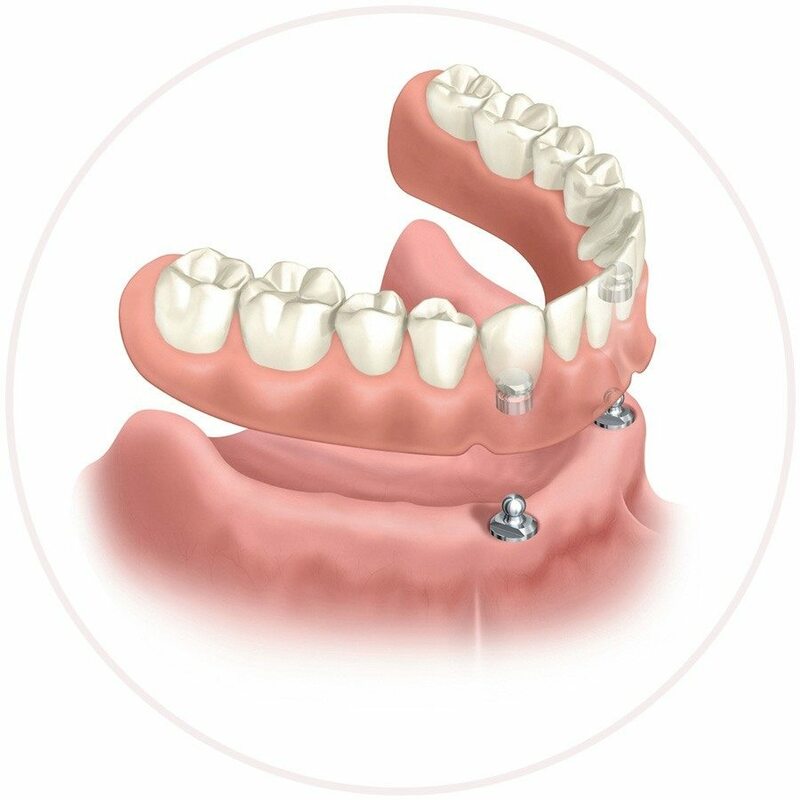 After the transitional phase you will be fitted with a custom bridge that screws directly into the dental implants. Your new teeth are firmly supported by the jaw, stimulating it and halting the bone loss. Are your current dentures loose and uncomfortable? Do they move about when you talk and eat? Do you find them embarrassing? Have you lost confidence due to problems with your dentures? Dental implant supported dentures may be the answer for you. The placement of dental implants into your residual jawbone can help to stabilise loose dentures, converting them into secure ,comfortable dentures which work well for you – making eating straightforward and giving you confidence in your day-to-day activities. Denture Implant mostly is made for the lower jaw because regular dentures tend to be less stable there. Usually, a regular denture made to fit an upper jaw is quite stable on its own and doesn’t need the extra support offered by multiple dental implants. However, you can receive a denture implant in either the upper or lower jaw. You can easily remove your denture implant for regular cleaning .